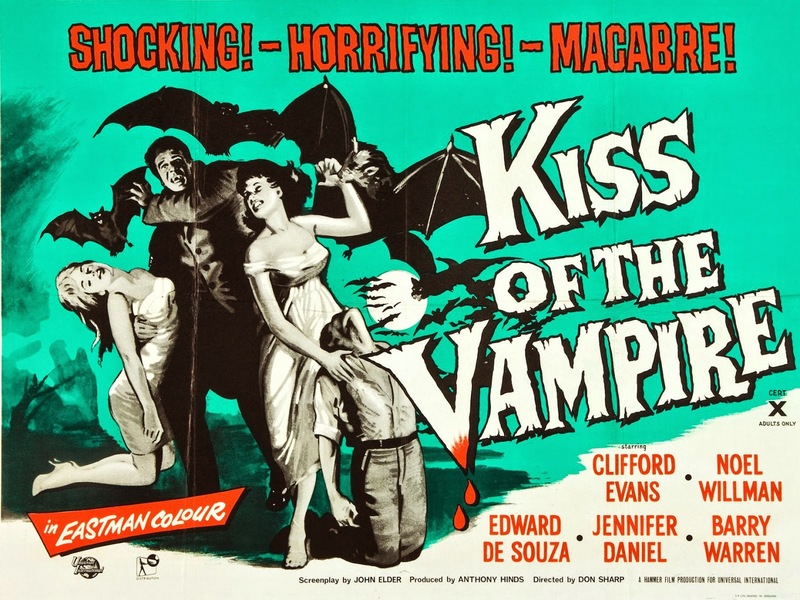 Kiss of The Vampire was a decent second-tier Hammer film with some very effective scenes, although hobbled by an all-too-contrived plot and a climax that should have been scrapped considering the abysmal quality of the FX. The story is something like Alfred Hitchcock's The Lady Vanishes meets Hammer's own The Devil Rides Out - After an intriguing opening that features a staking of a vampire through a coffin, we zoom into the lead couple stranded when their automobile runs out of petrol while passing by the very same tiny European village that features in almost every Hammer production. Almost immediately after they book into the local inn, they are invited to supper by the local nobleman Dr. Ravna (Noel Willman) whose castle houses several of the props from Dracula's lair in the 1958 Hammer film, and not just because he purchased them in a Transylvanian yard sale. The up-to-no-good doctor's children Carl and Sabena insist on the couple attending a masked ball at the castle. During the course of this ball, the wife disappears and the husband's attempts to find her are stonewalled by Ravna's family. It is then time for Prof Van Helsing...oops, Prof Zimmer to step in and announce his plan to put an end to this ee-vil. The plot hinges on some major contrivances like a whole bunch of vampires being conveniently assembled at the castle at the very moment the professor finds it suitable to invoke supernatural forces to destroy them; admittedly, calling on Beelzebub to help with vampire-killing is intriguing, but why does the Lord of The Flies send in an army of (rubber) bats? The sequence of the masked ball is certainly atmospheric (though handily eclipsed the following year by Roger Corman's Masque of Red Death), and I will also applaud the solidity of the supporting cast, especially Barry Warren as Carl, and Peter Madden as the simple-minded local innkeeper Bruno. While Clifford Evans has a harsh commanding presence as Prof Zimmer, Willman's Dr. Ravna comes off as purely formal, lacking the inner menace that would make him a formidable adversary. The vampires are such a walking list of vulnerabilities - a dab of garlic essence on a door traps them within, an impromptu cross outlined in blood has them in shivers - it's a surprise they have any hold in the village instead of being laughed out of it. The climax with the aforementioned rubber bats is more hilarious than thrilling. But at 88 min, there's little time to ruminate and a fair bit of amusement to be had.